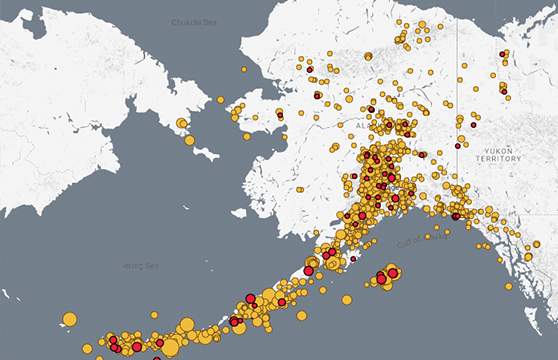 If you've paid much attention to earthquakes in Alaska over the last few years, you've probably heard the phrase “earthquake swarm.” In 2014, a swarm near Noatak rattled residents with five magnitude 5.3-5.7 earthquakes spread out over two months. In 2015, a swarm off St. George Island shook the normally quiet Pribilofs. And in 2018, a swarm in the eastern Brooks Range accounted for more than 2,000 of the year's record 55,000 earthquakes in Alaska. But what is a swarm, and how is it different from other earthquake activity? Most Alaskans are well acquainted with the classic mainshock-aftershock sequence: a large earthquake strikes, followed by a series of smaller aftershocks that taper off over time. When a smaller earthquake comes before the mainshock, we call it a foreshock-mainshock-aftershock sequence, but it's essentially the same thing. In both cases, you have one larger earthquake and then a series of smaller aftershocks as the earth adjusts to changes in stress caused by the mainshock. These are the most common types of earthquake sequences. Long gone are times when seismic arrivals were read off paper or film recordings by human eyes and manually processed with pen and paper. The Alaska Earthquake Center is revising the magnitude of the November 30, 2018 Anchorage earthquake from 7.0 to 7.1.